It is ot easy to see in the picture, but the frame I have made around the picture actuallt glitters. Hand drew little circles, filled them with my white sakura gel pen and put white stickles on top. 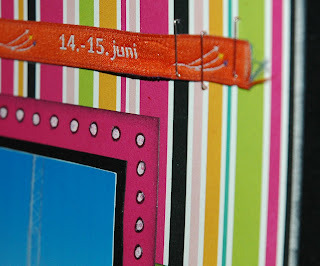 The ribbon above the picture is the arm band from the airshow. and of course, its always a joy to see photos of your little ones! 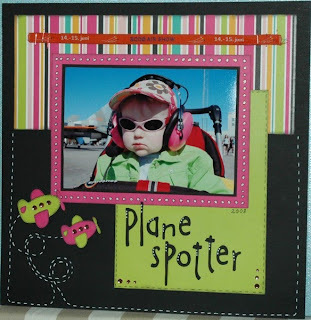 Love what you did color wise with this and the airplanes with gems, and the white stitching out the plane! how smart is that! This is such an adorable layout of your daughter. 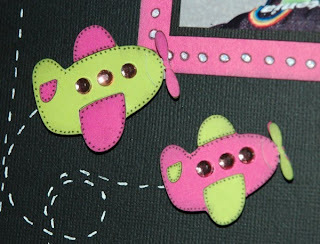 I love those little airplanes with the white stitching, looks so cute and those colors are fab.. This is so sweet. I really like the bright colors against the black background, and your doodling is just perfect ... it adds so much to your design. Great layout ... just awesome! This is just simply adorable! What a great photo and those little planes are perfect....lovely work...thanx for playing along!